Are you a WS splits geek? Have you tried studying all the splits for different years from the WS website? Excel files, pdfs, text files, google spreadsheets, etc. While it is awesome to have all the splits available, it is cumbersome to compare different years or different people. 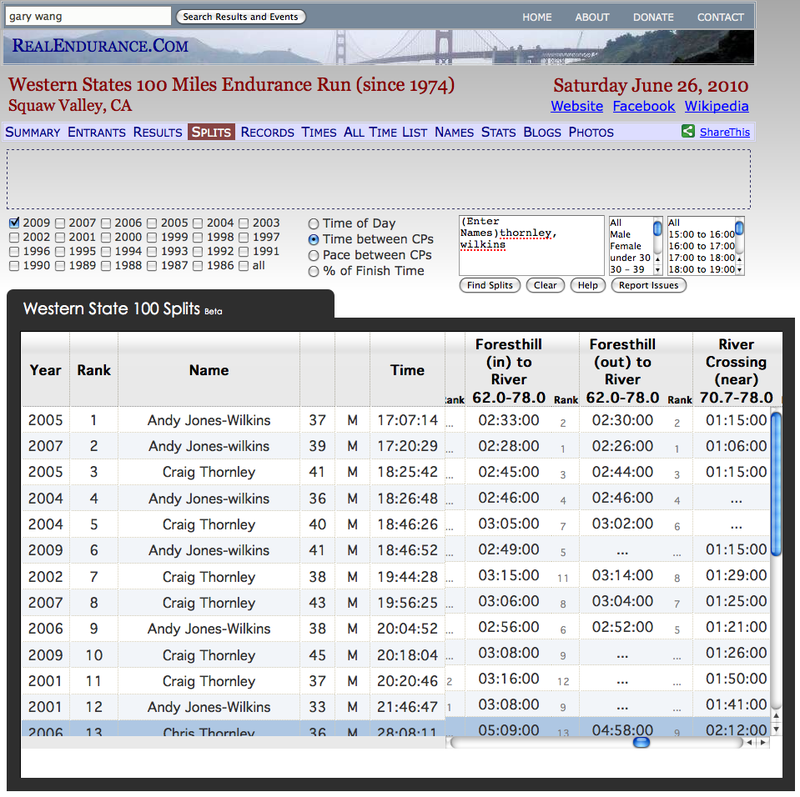 Gary Wang, 11 time WS finisher, the mastermind behind realendurance.com, and geek extraordinaire, has spent the last few weeks adding all the WS splits into his database of results. In addition to seeing split details for a single person via detail view, he has built some scripts so we can compare splits of different users and different years and a couple of other criteria. It’s quite cool and while he’s still working the bugs out, you can compare splits of several people over multiple years. 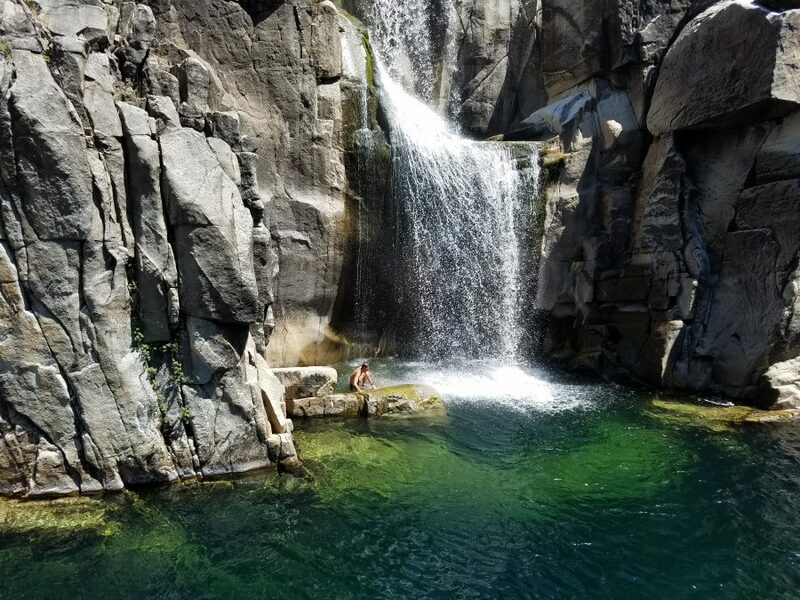 Here is the link directly to the new feature. Be sure to give Gary feedback as he continues to improve this new feature. It should also be noted that while he currently only has splits for WS, he intends to add splits for all major 100s. Thanks, Gary, for all your work. This looks cool, but I’ve not had any luck getting it to produce results. I’d love to see how my Cal Street compares to you big boys. @Bryon Powell, Have you checked “Time between CP’s?” You ran 2:43 Cal St in 2005. Fast, man. I’ve heard from a couple of people that they’re having troubles getting results. Please do report your issues to Gary Wang. Thanks for sharing this..it has some very good info indeed to pour over as I build a plan. It has a few issues but it’s beta. Each viewer does have some issues but I still was able to gather content I find very useful. Sweet, just found Visalia CA runners Roger Sebert and J.D. Fischers Splits from the late 80’s. I’m going to have to print this out. @AJW, you definitely have run well on Cal St. Yes, my PR is 2:44 during my 18:25 year. Think you can run sub 2:30 again? « Wanna Be A More Useful Trail Worker?